We inquire the minimum requirement for inducing tumor progression and cancer stem cells. We also investigate the genetic interactions between such minimum requirements. We plan to establish in vitro cancer stem cell models that stably express various features cancer stem cells on dish. Such system would critically contribute to screen genes related to cancer stem cells or to develop drugs specifically targeting cancer stem cells. 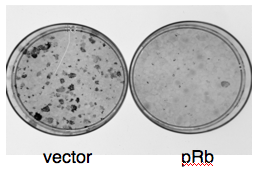 We isolated RECK gene as an antagonistic downstream target of K-rasV12. It encodes a GPI-anchored glycoprotein with multiple domains analogous to EGF, crmA and metalloendopeptidase substrates. RECK regulates Ras, beta1-integrin and Notch signaling through interaction with several soluble MMPs, MT1-MMP, ADAM10 and CD13/APN. RECK expression in various cancers significantly predicts favorable prognosis of patients. Many scientists are interested in transcriptional/post-transcriptional regulation of this gene by various oncogenic signals. We particularly focus on the cellular signals controlled by RECK. We focus on the genetic interaction of Rb and Ras in mammals. 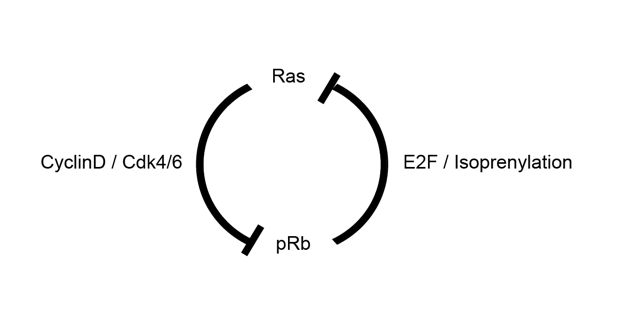 Ras regulates phosphorylation status of Rb via D-type Cyclins and CDK4/6; inversely, Rb controls isoprenylation of Ras in E2F- and SREBP-dependent manner. We found Rb-deficient carcinogenesis in thyroid C cells is antagonized by elevated N-Ras activity and subsequent DNA damage response and cellular senescence. We speculate that this Rb-Ras interaction plays critical roles in developing cancer stem cells. We are testing this hypothesis using various compound knockout mice. J Biochem. 2013 Aug 5. [Epub ahead of print] Regulatory interaction between NBS1 and DNMT1 responding to DNA damage. Hayashi N, Kobayashi M, Shamma A, Morimura Y, Takahashi C, Yamamoto KI. ○Development of drugs targeting cancer stem cells and cancer cell metabolism.